Click on the plus(+) or minus(-) buttons to zoom in and out. Click on the arrow buttons or drag to move the map around. Click on the green location markers to view details. Terendak Queen (fitted with tags MY4444/MY4445) attached with a satellite transmitter at Kem Terendak with the cooperation of military personnel and the state Department of Fisheries. Terendak Queen was encountered for the first time this season on the day of the deployment (11 August 2007) when she was fitted with the tag numbers MY4444/MY4445 and a satellite transmitter (model KIWISAT 101) was attached to her carapace (shell). 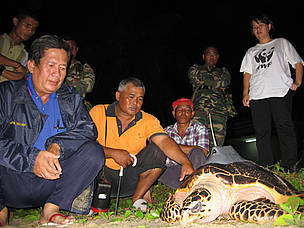 She was released at about 4.46am and came up to nest again weeks later for her second nesting at Padang Kemunting (a beach adjacent to Kem Terendak), her third back at Kem Terendak, and her fourth at Tanjung Dahan (around 15km from Kem Terendak, her original nesting beach). She has since been detected cruising out of her usual nesting radius and embarking on a journey which took her to her foraging home in the waters of the Riau Archipelago, off the islands surrounding Pulau Temiang.